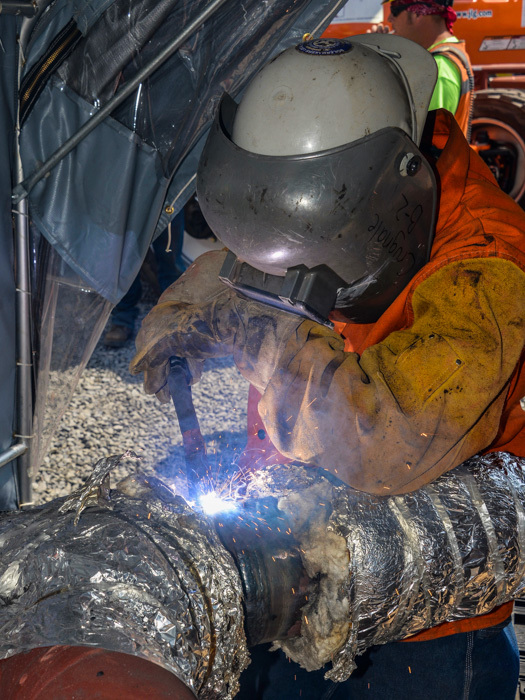 L-154’s David Campbell seal welds a seam on a turbine exhaust duct. Left to right, Kiewit Project Manager Jason Proskovec, L-13 Business Agent Roger Jayne and L-13 Business Manager Martin Williams discuss Boilermaker work. 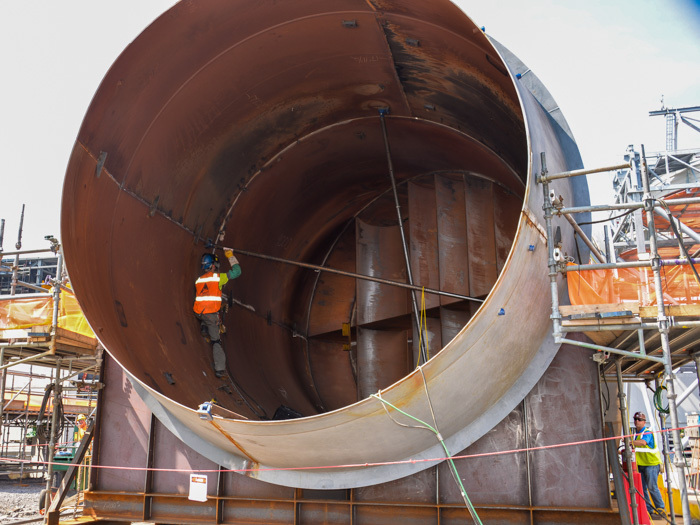 BOILERMAKERS LIFT A FILTER HOUSE TRANSITION DUCT at the 1,500 MW Lackawanna Energy Center in Jessup, Pennsylvania. Mike Crugnale, L-13, welds a downcomer, which will carry cold water from the steam drum as steam is condensed and recirculated. Members man a tagline and keep a watchful eye during a lift. Located in the borough of Jessup, near Scranton, the Lackawanna Energy Center’s three gas-powered turbines, three heat recovery steam generators (HRSGs) and a steam turbine will produce 1,500 megawatts of electricity when completed in 2019. Boilermakers are constructing the HRSGs as well as upper sections of the air-cooled condensers and other project components. 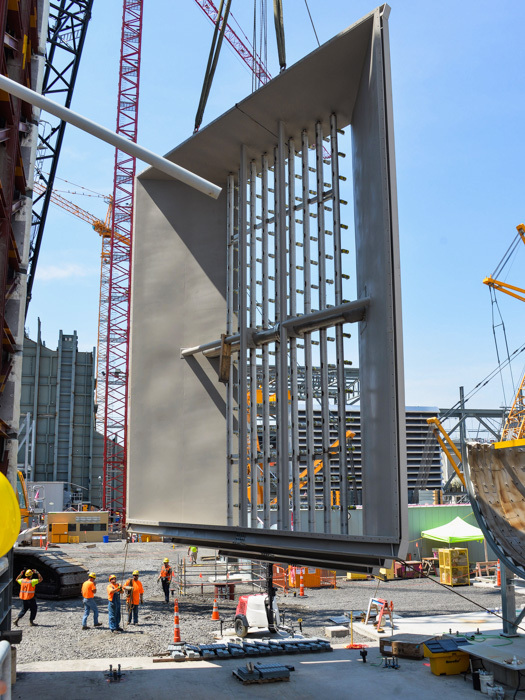 Kiewit Power Constructors Co. is the prime contractor on the job, which is being built for Invenergy. At peak, some 800 union workers from various crafts will be onsite. Kiewit Project Manager Jason Proskovec said the gas plant, the largest to be built by Kiewit to date, uses a unique single-shaft design by General Electric. The single-shaft design increases reliability and simplifies operations, according to GE. Proskovec said fuel for the plant will come from the Marcellus shale field via pipeline. The Marcellus field is one of the largest shale formations in the United States, extending across much of Ohio, West Virginia, Pennsylvania and New York. “The Lackawanna project is emblematic of the shift that is happening in our nation’s energy sector away from coal to natural gas,” said L-13 Business Manager/Secretary-Treasurer Martin Williams. “The market, along with [other factors], is favoring natural gas as the dominant fuel source for power generation.” Natural gas-fired plants emit about half the carbon dioxide as coal-fired plants. 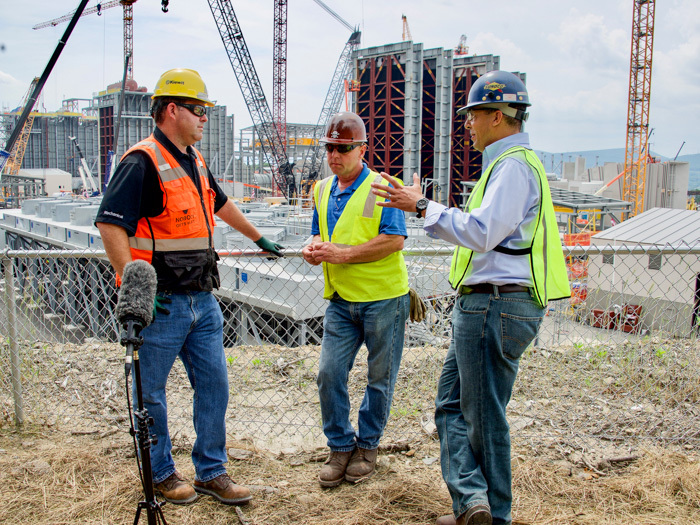 Williams said that the Lackawanna project is one of four combined cycle gas plants the lodge is currently helping to construct in Pennsylvania, and more such plants are on the horizon in the Keystone State. Abundant, cheap natural gas has also spurred activity at area refineries where Local 13 members work. Refinery maintenance work accounts for about half of the lodge’s annual man-hours, he noted. The implications of changing fuel source preferences are not lost on the Boilermakers union. Historically, coal-fired plants have dominated the union’s work in the power generation industry, both new construction and outages. Natural gas plants for the first time in U.S. history accounted for more power generation than coal plants in 2016. According to the U.S. Energy Information Administration, natural gas-fired generating capacity is set to grow by 36.6 gigawatts (GW) over 2017-2018. Together, coal and gas make up nearly two thirds of all electricity generation in the United States, with each fuel source accounting for about 31-32 percent of total U.S. output. Of course, that doesn’t mean Boilermakers are giving up on coal. Williams acknowledges that coal-fired power generation will continue to be an important source of Boilermaker work, and manning those jobs will remain a priority.